In defense of the plastic ocarina. Plastic is a material that is often associated with being cheap and poor quality. Which is not a wrong conclusion. Many things that are made of plastic are cheap and of poor quality, but often it does the job nearly as good as it’s higher quality, more expensive counterpart. But in ocarinas the quality of the instrument is in correlation, to the quality of the sound; as is with other instruments. And no-one wants an instrument that sounds bad. When people are new to the ocarina, some tend to steer away from the plastic because they think it will sound bad and is a poor instrument. This is true for some of the plastic ocarinas. As most of the ocarinas that are made as toys, and sold at dollar-stores and such are made of plastic. Still there are examples of clay ocarinas that are of poor quality too, but these aren’t marketed as toys and therefore not so readily available. 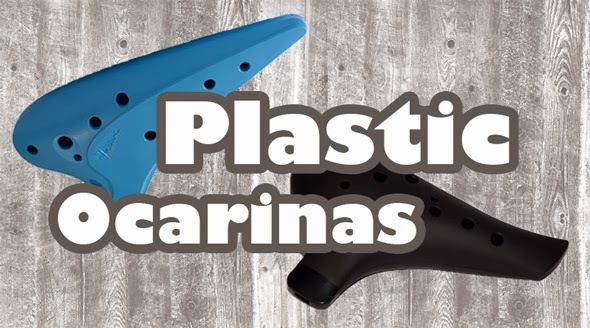 So some of the reason behind why people stay away from the plastic, and maybe even why some people have a bad experience with the ocarina is because the ocarinas they’ve come across aren’t really instruments. They’re more of a toy. Now over to my experience with plastic ocarinas. My first ocarina, was a plastic ocarina. It took some time for me to get a somewhat nice sound out of it, but that was wasn’t the ocarinas fault. I was new to the instrument and new to playing in general. But after some practicing it got better. Now the plastic does have some “issues” compared to a clay equivalent. The main things are condensation which builds up in the wind-way and that the highest notes are a bit harder to reach. But both of these problems can be reduced with time and practice. The advantages that the plastic hold as a beginners ocarina is that it is cheaper and that it is much more durable. You can drop it on the ground without it breaking, though I wouldn’t recommend making it a habit. Now I’m not familiar with many plastic ocarinas, but I know from my own experience that the Focalink Plastic Alto C and the Night by Noble Plastic Alto C (same as Noble Plastic Alto C only with Taiwanese sub-holes) are great. If you want too see for yourself I’ve uploaded a video with each one on youtube. I’m not the best player, but if you watch some of my other videos you see that they are both comparable to my Focalink Double Alto C. Except for in range of course.